Are you getting worn down by the harvest grind? If you didn’t answer ‘yes’ to that question, then you’re either not being honest or you’re missing the signs of fatigue. Experts like Donna Trottier of AgSafe Alberta wholeheartedly agree. Her organization has a “quick start guide” for dealing with fatigue. The four-page primer says that being fatigued is four times more likely to lead to an accident than being impaired by drugs or alcohol. In fact, pulling an all-nighter is much like having a few too many. “If everybody is worn out, it’s better to shut it down and start again fresh in the morning than have an incident occur,” she said. That’s one of the ironclad rules for Serfas, who farms with his father and brother, and has up to 30 employees during seeding and harvest. Having a large crew gives Serfas more options when it comes to building in breaks and days off into the schedule, but what do you do if it’s just you? “If I’m really tired, I will take a nap,” said Charlie Leskiw, who runs his operation — a grain farm and small cattle herd near St. Paul — by himself. The past couple of years have been challenging, and when times are stressful, getting a good night’s sleep is even more important, he said. And while he’ll push things a bit, there’s a limit. “If conditions are good to harvest, I will combine until midnight or later,” said Leskiw. “When conditions are right, you keep going. After ambition, then adrenaline kicks in. Taking breaks is another of Trottier’s top tips. “Plan your day so that you can take some breaks, whether that is having someone spell you off so you can take a break, or just shut down for a little bit if you have to,” she said. That recommendation is intertwined with another top tip — keep your equipment in good shape. That not only means your machinery, but also your own body. “Give yourself good nutrition and rest — that’s the best way to manage fatigue,” said Trottier. The former means ditching junk food and caffeinated beverages in favour of healthy meals and snacks along with hydrating with water. 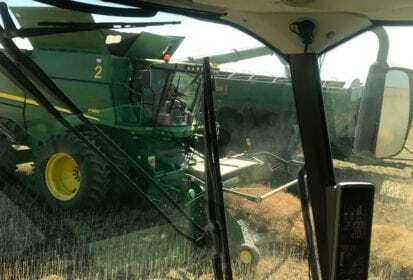 AgSafe also urges farmers to get out of the combine once in a while — take a little walk in the field and do some stretching. It’s a good way to both get the blood flowing and one of the ways to assess how you’re doing. One thought looms large when Serfas is planning the harvest schedule. On most farms, the kids are your own and bringing them to the field during harvest is something virtually every family does. But be smart about it, said Trottier. Leskiw gets some help from neighbours, but is largely on his own. So he follows AgSafe’s recommendation to “continually assess” his fatigue level. “That’s always in the back of my mind,” he said. “Never keep working to the extent that you’re actually putting yourself at risk or in harm’s way, or at the risk of an accident. “They might not bring it up themselves, so it’s good to have someone to ask people, ‘Are you OK? Are you good to go on?’” said Trottier. If that question sparks an irritable ‘of course I am,’ it’s a sign the truth might be the opposite. Being short tempered is an indicator of fatigue. Other signs include an upset stomach, headaches, blurred vision, slow reflexes, poor concentration, and, of course, dozing off. For more tips on working safe this harvest, see AgSafe’s guide: Fatigue Management on the Farm. It can be found in the Resources section of www.agsafeab.ca. For Serfas, dealing with fatigue can be summed up very simply. This article was originally published in the Sept. 10, 2018 issue of the Alberta Farmer Express.